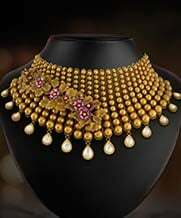 + Is it secure to buy gold online at joyalukkas.in? Yes. Our online shopping site has built-in security measures that keep your information as well as the details of the transaction safe. However, always use caution when shopping online and avoid sharing your passwords and financial details on unsecured sites. + What happens if my order is delivered damaged? In the unlikely event that your order is delivered to you visibly damaged, please do not accept the package from the delivery team and immediately contact +91 80 25127900 to inform Joyalukkas Customer Care of the issue. + What happens if the product I ordered is damaged? Our team ensures the quality of the product with several checks before handing it over for delivery. However, if the package is damaged during delivery, please take photos and/or videos of the item/s and email us at [email protected] or contact our customer support at +91 80 25127900. + How do I register on joyalukkas.in? Click the 'User Icon' at the right-top of the website and give your mobile number and confirm it with the OTP, sent to your mobile number. Complete the registration by giving the additional information required. +I forgot my password. What should I do? Simply click on the ‘Forgot password’ link and follow the instructions as prompted. You can change your password in the My Account page. Just click on ‘My Password’ and follow the instructions. Please read our ‘Cancellation Policy’ in case your issue falls under circumstances already specified. Should you wish to proceed with canceling your order, you can initiate a request by calling +91 80 25127900 or writing to [email protected]. +How long will it take for my purchase to be delivered? We have several products under the Same Day Shipping category. These are ready-to-ship products and will likely be delivered at your address in 2-3 working days. For most items, an estimated time of delivery is provided prior to finalizing your order. +What type of jewellery is recommended for sensitive skin? The higher the karat, the higher the ratio of gold to alloys. 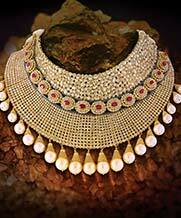 Anything below 14k means that at least half of the jewellery consists of other alloys, which could be copper or brass. 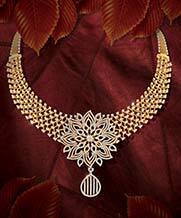 Jewellery labeled "gold-plated" usually contain a nickel base or nickel alloys that can irritate certain skin types. We suggest to use 14K, 18K, 22K or 24K yellow gold or rose gold instead. +Can I wear a platinum ring while doing manual work such as cleaning or gardening? Platinum is extremely durable and strong, making it ideal for daily wear jewellery. It is also highly resistant to stress and withstands both extreme heat and extreme cold. However, harsh chemicals and extreme wear can affect the appearance of your jewellery, so we recommend removing any before you clean, do the laundry or work in your garden. +What is the best way to clean a platinum ring? Unlike other jewellery metals, platinum is actually deemed to look better with wear. Surface scratches form a patina that’s considered highly desirable,however, the metal can easily be returned to its original polished state by a jeweller if that’s what you prefer. d. Mix mild dish detergent with warm water. Less abrasive than other cleaners, dish detergent is the best option for cleaning your gold jewellery.Just add a few drops to a small bowl of warm water and use it with a soft brush or cloth to clean your jewellery. e. Soak your jewellery. You can leave your jewellery in the soap mixture for up to three hours. You can’t over-clean gold with this mixture,so don’t worry about leaving it in too long. If your jewellery isn’t that dirty, you can leave it in for ten to fifteen minutes. f. Rinse your gold jewellery thoroughly in warm water. Make sure that all traces of suds are gone, especially if you’re cleaning a heavily ornamented piece.The water should run clear when you’re finished. a. Try not to touch the diamond. If you love how your diamond sparkles, try to keep your fingers off it. As you touch it, you pass oil from your fingers to the diamond, which can make it look dull. b. Remove your ring when working with chemicals. When you're cleaning, take your ring off or put rubber gloves on to protect your hands and ring. c. Take your jewellery off before gardening, moving furniture, or performing heavy lifting or risk scratching your jewellery, or worse, you could also knock the diamond out of its setting. 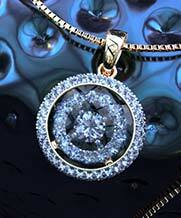 d. Take your diamond jewellery to a professional jeweller twice a year. 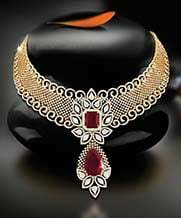 Diamond jewellery needs to be checked by a professional jeweller regularly. They will look at the prongs and mountings to make sure they're in good shape. If something is damaged, the jeweller can repair it before something breaks and you lose a diamond. e. Make a cleaning solution. Though you can use a pre-made jewellery solution, you can make one from items in your home. Try mixing a few drops of dish washing liquid in a cup of warm water, which will help remove grease. f. Soak the diamond jewellery. 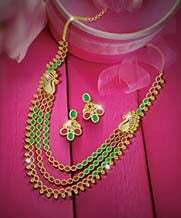 To help break up the dirt and grime of daily life, it helps to let the jewellery sit in the cleaning solution. Leave it for about 5 minutes before moving on to the next step. You may need to leave it in longer if the jewellery is particularly dirty. g. Scrub the jewellery with a soft toothbrush. Buy a new toothbrush just for this purpose. Pull the jewellery out of the cleaning solution and gently scrub all around the diamond. Don't forget to get the sides and the back of the diamond. h. Rinse and dry. Wash the jewellery off in clean, running water to remove any remaining dirt and soap. Use a soft cloth (lint-free) to dry off the diamond and the rest of the jewellery. a. Be careful of light and heat Just as the sun’s harmful rays can damage our skin, light and heat can affect a coloured gemstones’ durability and colour. Over time, and in excess, they can also fade or damage some gemstones such as amethyst, kunzite, topaz and shell cameos. b. 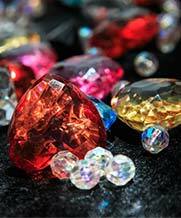 Keep your jewellery away from chemicals Exposure to chemicals can damage or discolour some coloured gems. Even everyday substances like hairspray, lotion, perfume or other cosmetics can contain chemicals that will permanently damage the surface of your gemstones. c. Use ultrasonic cleaners with caution You should be aware that not all gems and jewellery can be safely cleaned in ultrasonic cleaners. The vibration generated by the machine can sometimes shake gems loose or chip gems that are set with their girdles touching. Try to leave this method up to your professional jewellery cleaner. d. Safely store your jewellery Proper jewellery storage is often overlooked. Jewellery should never be tossed into a drawer or on top of a dresser unless you’re fine with scratched jewellery and damaged gems. Has your silver jewellery become dull-looking? Or worse, has it turned black? Tarnishing is a layer either black or yellow in colour that happens when silver comes in contact with sulfur or hydrogen. At this point, it is best to take the item to a professional cleaner. Safely storing your silver jewellery in a velvet pouch or lined box and keeping its exposure to light and oxygen to a minimum is the best way to keep your silver shining. +How do I know my ring size? Click here for our helpful guide to finding the right ring size for you. +How do I know my bangle size? Click here for our helpful guide to finding your perfect bangle size. +How do I purchase the Joyalukkas Gift Card? You can purchase Gift Cards on our website or from any Joyalukkas showroom in India. +Where can I use the Gift Card? The Gift Card is redeemable at face value for a wide range of jewellery and accessories at all Joyalukkas India showrooms. +How much money I can put on my Gift Card? The Joyalukkas Gift Card is fully customisable, and you can choose denominations from Rs. 500 to Rs. 50000 per card. +How can I check my balance on the Gift Card? You can check your Gift Card balance on http://www.joyalukkasgifts.in or by visiting your nearest Joyalukkas showroom. +How many times can I use my Gift Card? There is no limit to the number of times you can use your Gift Card as long as there is still a balance amount remaining. +Can I top up my Gift Card? The value of a Joyalukkas Gift Card is final when purchased. While you can’t top its balance, you can purchase a new Gift Card in a denomination of your choice from Rs. 500 to Rs. 50,000. +Will the receiver of the GiftCard receive a statement? We do not send a statement for Joyalukkas Gift Card use. 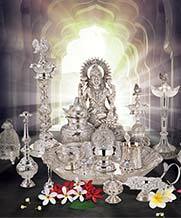 However, you can check your outstanding balance on http://www.joyalukkasgifts.in. +Can I get a refund on items purchased using the Gift Card? As Per our Return & Exchange policy, any amounts refunded to the customer will be credited to the source of payment, which in this case is the Gift Card, and can be used freely for purchase at any Joyalukkas showroom. Please click here for more on our Return & Exchange Policy. +Does the Gift Card have an expiry date? 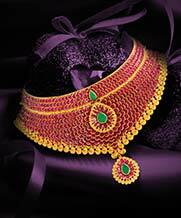 The Joyalukas Gift Card is valid for use at any Joyalukkas showroom as long as an outstanding balance is maintained. 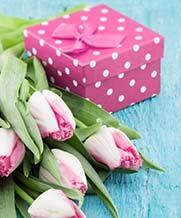 You can block your lost Gift Card yourself by logging on to http://www.joyalukkasgifts.in. Alternatively, you can contact our Customer Care team to initiate it for you. Once the Gift Card is blocked, you can request for a replacement with the outstanding card balance by providing required credentials. Joyalukkas will, however, not be held responsible for any amount lost on the card’s balance prior to blocking. +What are the available payment options? +How does the online payment system work? Your bank or debit/credit card company will directly authorize the transaction on the payment gateway page. Once we receive their authorization, your order will be finalized. You will know right away if your credit card was accepted. +What are the reasons where my credit card might be refused? For more details, please contact your debit/ credit card issuing bank for clarification. +What is the ‘Save this Card’ option on the payment page? This feature allows you to enter your financial details and save it for future use, which will make your checkout quicker.Your information is kept safely on our secured payment gateway and you will still be asked fore verification to complete future transactions. +Can I speak to someone about a problem on the website? We always welcome your valuable feedback and strive to offer you the joy of jewellery shopping with every visit.You can contact us by emailing [email protected], direct chat on our website or by calling +91 8025127900. +How long would it take for me to receive my order? It generally takes 2 - 7 for your items to reach you after we hand it over to the courier. 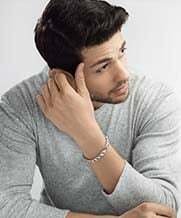 Each product is made to order and an estimated day of arrival is provided along with the jewellery’s details on our site’s specifications page. +Do you offer free shipping? We offer free shipping for all items ordered, regardless of value or quantity. +Do you shipment all over India? We ship to all major cities in India. You can check the availability of the pin code on our website. If your city is not included on our list, you can contact us on +91 80 25127900. +What can I do if my order is delayed? For delivery and all other issues, please do not hesitate to call our Customer Care team on +91 80 25127900 or email [email protected] immediately. We will be happy to provide you the best support for your queries. +What happens if my order gets shipped to the wrong address? Our secured delivery system makes this unlikely, although some circumstances may be beyond our control. If you have not received your order in a timely manner. Please call our Customer Care team on +91 80 25127900 or email [email protected] for assistance. +Where can I find my tracking number? +Where can I view an invoice for my order? +What happens if my order is delivered damaged? +What happens if the product I ordered is damaged?